So gentle reader, if you were the head of this magical movie studio, what would you do? *cough cough* Excuse me. I’m not sure what came over me right there. In any case, that’s pretty much what Disney seems to be doing. 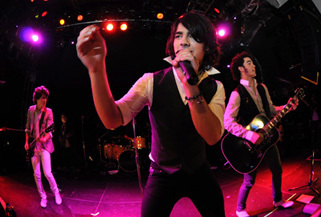 In a decision that was as easy to make as greenlighting a sequel to Twilight, the folks at the Mouse House have chosen to honor the Jonas Brothers (their hot act du jour) with the next of these 3-D concert adventures. Based on the set list and trailer, it doesn’t look they’ll be deviating too far from the structure that proved so successful with Miley. Flashy editing? Check. Screaming girls? Check. Behind the scenes footage? Check. The only things that appear to be different are that the film will include two guest stars, adding the inconsequential star power of Dani Lovato and the massive, all-encompassing, get-out-of-the-way-or-you’ll-get-run-over star power of Taylor Swift and releasing the film a few weeks after Super Bowl weekend instead of on it. Both of these moves, I would imagine, will help the Jonas Brothers outgross their precursor’s film. Add on to that the fact that a year later, there are more theatres equipped with Disney 3-D technology, and the potential gross goes even higher. I hope that whoever goes to see this film (and I’m sure there will be plenty) has a lot of fun. I hope that whoever gets dragged to see this film with their girlfriend/daughter/niece/friend (and I’m sure there will be plenty) has fun, too. As for me, I think I’ll sit this one out.